Glacier Super Matt White & Super Matt Fjord is just stunning together. Glacier Matt White gives you a blank canvas to add a splash of colour. Shown here with the pastel blue shade of Super Matt Fjord. Made to measure doors make it easy working with traditional features such as chimney breasts and extra high ceilings. One way to get around extra high ceiling is shown in the image with top boxes. Always make sure every possible space is usable space with a fitted bedroom. 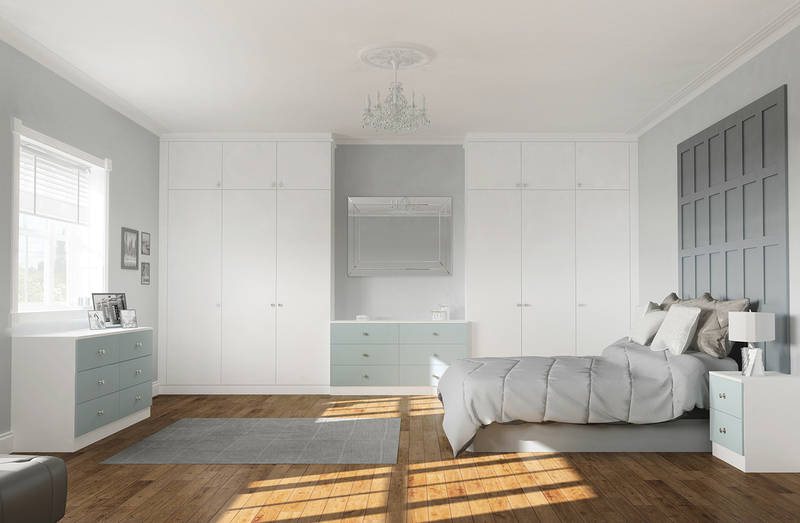 This style bedroom is available in a wide range of colours and made to measure sizes to maximise your storage space.